Android Web Browser Faster Than iPhone -- Or Is It? Sick of waiting for pages to load on your mobile device? Get an iPad or iPhone. That’s the upshot of a mobile browser speed study done by a company called Gomez. They found that Apple’s mobile version of Safari was fastest and BlackBerry’s browser the slowest. 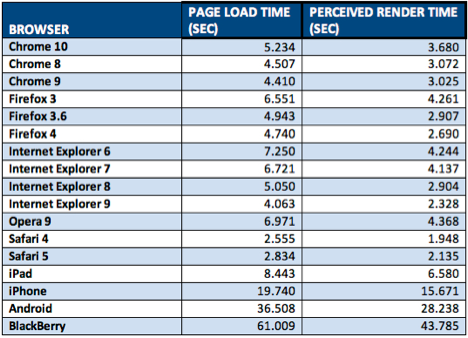 According to Gomez, the iPad fully loads pages in 8.4 seconds on average. The iPhone comes in second at 19.7 seconds, followed by Android at 36.5 seconds, and Blackberry at 61 seconds. Gomez also analyzed perceived page loading times--that is, how long it took each browser to load the items visible "above the fold" on screen (i.e. the elements visible to you when you first visit the page without scrolling down). 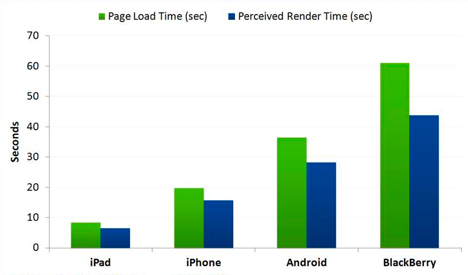 Perceived load times are shorter because … In this, the iPad again came out on top, with a perceived load time of roughly 6.6 seconds. The iPhone clocked in at about 15.7 seconds, followed by Android at 28.2 second, and BlackBerry at around 43.8 seconds. Some have tested mobile browsers on a particular OS--such as our Android browser comparison from September--or have compared browsing on one phone to browsing on another, but as far as we're aware, nobody else has released this sort of mobile browser speed comparison before. These are by no means end-all, be-all numbers. Browser speed testing can be a bit of a thorny issue. There are many variables involved, depending on your hardware, your network connection, your operating system, the Web site itself, and so forth. For example, Gomez's numbers don't match up exactly with the testing we've previously done. In the case of Gomez, the company, which helps companies improve the performance of their Websites and applications, decided to take what it considers to be a "real-world" approach to measuring browser performance. Its data is based on over 282 million Webpages served across over 200 popular sites. Gomez used data collected from business customers that use its performance monitoring services. It only takes into account Webpages visited using the browser included with the operating system, so browsers like Opera Mini were not included. Also, since the data is in aggregate, it includes data from both Wi-Fi and cellular network users, and users from different cellular networks. It also includes data from all sorts of different phones and tablets with different hardware configurations. Still the information they provided to us is interesting, and gives us at least an idea of what the general experience of using each browser is like. And as we've said in the past, other factors beside speed should dictate your choice in browsers--and now, smartphone OSes. Go with whatever works best for you. How about you? Do Gomez's numbers reflect what you've experienced? Let us know what you think by leaving a comment below.